Since 1970, as a consequence of Malaysia’s New Economic Policy (NEP) and its integration into the global economy, the development achievements and per capita GDP growth of the resource-rich state of Sarawak have been impressive—although not without problems. Since timber and petroleum resources are exhaustible, and there is a concern with finding new sources of growth and revenue, the federal and state governments advocated industrial diversification in 2008 via the development of a multibillion-ringgit regional development corridor called the Sarawak Corridor of Renewable Energy (SCORE). Central to the success of the huge developmental corridor was cheap hydroelectric power (HEP). For the Sarawak government, SCORE’s launch and eventual success were based on the availability of abundant water resources and suitable hydropower dam sites in the state. Yet, SCORE is likely to contribute to further environmental degradation and impact negatively upon the livelihoods and welfare of local communities. This paper examines this recent development trend and its consequences. Specifically, it examines the role of the Sarawak state government in advocating the construction of numerous HEP dams, the role of foreign and local investment in SCORE, and their collective impact upon the environment and local communities. What this paper reveals is the nexus of close relationships that binds key politicians in the state administration with crony businesses associated with foreign-linked contracts that has proven to be destructive socially and environmentally. In late October 2007 Abdul Aziz Husain, a former state secretary of Sarawak, brother-in-law of then Chief Minister Abdul Taib Mahmud, and the newly appointed group managing director of Sarawak Energy Berhad (SEB),1) gave a PowerPoint presentation titled “Chinese Power Plants in Malaysia—Present & Future Development” at the China—ASEAN Power Corporation & Development Forum in Nanning, China. His slide presentation, which was temporarily uploaded onto the Internet,2) outlined the Sarawak state government’s plans to transform the state from a rural backwater into the industrial powerhouse of Borneo via the construction of numerous hydroelectric mega-dams to supply power to the recently announced massive industrial corridor in the state. Called the Sarawak Corridor of Renewable Energy (SCORE), the corridor was conceived as part of a concerted attempt by the country’s policy planners in 2006 “to stimulate global and domestic investment in traditionally rural areas to create balanced development throughout the country” (RECODA 2015a) in a resource-rich part of the country. Providing the clean and green renewable energy to power the numerous expected local and foreign large-scale industrial investments in SCORE was the proposal (revealed by Abdul Aziz Husain) to construct 52 hydroelectric power (HEP) mega-dams. This was to be achieved with the assistance of Chinese companies and their dam-building technology, which would provide a total power capacity of 20,000 MW and an electricity potential generating capacity of 82,000 GWh/year (Abdul Aziz Husain 2007). Of these dams, 13 were scheduled to be built by 2020 and would have an installed capacity of 7,165 MW of electricity. Collectively, these 13 major dams would flood a total land area of 2,300 km2 and displace 30,000–50,000 indigenous people from over 235 settlements (BMF 2013a; 2013b) (see map in Appendix). Since then, indigenous community organizations along with local and international environmental groups have been struggling to stop the construction of these proposed hydroelectric mega-dams designed to power Sarawak well into the twenty-first century (The Star, July 23, 2008; Mongabay 2009; The Borneo Project n.d., Stop the Dams). No broad public consultations have been held to discuss whether such a large-scale industrial development program is desirable, let alone viable. Neither have local indigenous peoples affected by this dam-building program been consulted, in outright violation of the principles of the United Nations Declaration on Indigenous Peoples (UNDRIP) mandating prior and informed consent when development impacts indigenous peoples (The Borneo Project n.d., NGO Coalition). To date, detailed information about the Sarawak government’s official development plans involving so many HEP dams remains vague and under wraps except for what has been uploaded onto a Web site dedicated to the development of SCORE3) and regular official government press statements about its benefits (Sarawak Government 2014). Consequently, the various issues and impact of this development strategy remain largely unexamined. Former Chief Minister and now Governor Abdul Taib Mahmud has long been Sarawak’s most ardent proponent of hydroelectric dams (The Star, April 11, 2009; April 12, 2009). He remains convinced about their multiple benefits, which include reversing rural-urban population migration and transforming the basic infrastructure of the state’s interior regions (The Borneo Post, June 18, 2013). Since 1970, as a consequence of the New Economic Policy (NEP)4) and as a result of being integrated into the global economy, Sarawak has displayed impressive development achievements and per capita GDP growth—although not without problems. Since Sarawak’s economy is precipitated on massive resource extraction and primary commodity-based industries, the economy has seen significant wealth creation but one based on a pattern of resource exhaustion and environmental degradation with significant affiliated impacts upon local communities (Hong 1987; Colchester 1989; WRM and SAM 1989; Bevis 1995; Cleary and Eaton 1995; Majid-Cooke 1997; 1999; Kaur 1998a; IDEAL 1999; Brown 2001; BMF 2012a; Bryan et al. 2013). The sustainability of the current NEP-led development model—which is based on primary resource exhaustion, agricultural commodity plantation development, large-scale infrastructure, and regional industrial corridors—may just be undermined by its own success (Majid-Cooke 1997; Phoa 2003; BMF 2014). Hence, instead of improving the quality of life for the majority, the commissioning of numerous hydroelectric dam projects by the Sarawak state government in its single-minded pursuit of SCORE is likely to contribute to further environmental degradation and impact negatively upon the livelihoods and welfare of local communities (BMF 2010; 2012a; Yale Environment Review 2013; Sarawak Report, January 30, 2015). This paper examines the recent development trend and its consequences. Specifically, it examines the role of the Sarawak state government in advocating the construction of numerous HEP dams, the role of foreign and local investment in SCORE, and their collective impact upon the environment and local communities. What this paper reveals is the nexus of close relationships that binds key politicians in the state administration with crony businesses associated with foreign-linked contracts, which has proven to be destructive socially and environmentally. There is a whole body of literature on the political economy of development relating to state capture by corporate and political crony interests whereby politicians and agencies of the state, which in theory serve the people, are captured by interests antithetical to those of the public.5) These practices have been ongoing in Sarawak since independence, particularly in the form of crony business contract awards such as timber concessions, land grants, and infrastructure contracts (Milne 1973; Leigh 1991; Mason 1995; Brown 2001; Ross 2001; Aeria 2002; Mersat 2005; Straumann 2014). This paper contributes further to these studies by examining the recent expansion of crony political business links into a foreign-invested venture. The largest state in Malaysia, Sarawak holds rich resource deposits of petroleum, natural gas, coal, silica, and, until recently, timber and gold. Much land, post-logging, has been made available for modern commercial plantation agriculture, mainly oil palm and acacia pulp plantations.6) The state’s numerous large rivers are also potential generators of hydroelectric power to transform the state into a heavy industry powerhouse. Development achievement has been impressive since 1970. Sarawak’s transformation into a fast-growing state is reflected in its recurrently positive growth rates (see Table 1). Its economic growth has consistently weathered economic recessions—in 1985–86, 1998–2000, and 2008–09.7) However, Sarawak’s economic growth is also volatile. Annual GDP swings are large, with differences ranging as much as eight percentage points either way. Even as overall poverty levels have fallen, Sarawak’s Gini coefficient has fluctuated. From a reading of 0.501 (1979), the Gini fell to a low of 0.407 (1999) before rising again to 0.442 (2004) and 0.448 (2009). This means that income and wealth inequality in the state actually fell in the first 30 years of the NEP before rising again (UNDP 2007; Unit Perancang Ekonomi 2011). It is the hard-core poor who are most affected. Current data for this category shows a similar trend since 2007, when the percentage of hard-core poor, which had dropped to 0.7 percent from a high of 10 percent (1984), reversed and rose again to 1 percent in 2009 (Government of Malaysia 2008, 58; Unit Perancang Ekonomi 2011). However, a closer examination indicates a more nuanced picture. The median of the 7.824 million ASBN unit holders in Malaysia falls in the lowest category of “RM5,000 and below” with a mean investment/saving of RM611 (see Table 3). Hence, although the mean investment/saving of the 1.098 million ASBN unit holders in Sarawak each was RM15,000 (The Star, February 20, 2013), there is likely relatively little difference in the median pattern of ASBN unit holders in the state, i.e. in the lowest “RM5,000 and below” category with a mean investment/saving of RM611. While the ASN/ASB unit trust funds were set up to encourage savings and long-term investments among low-income Bumiputeras, the reality is that a majority of Bumiputeras in the state do not earn sufficient incomes to give them the extra cash after monthly expenses to allocate funds to savings and long-term investments in unit trust schemes. This would also explain why, in 2006, Sarawak was ranked 11th out of 14 in Malaysia’s overall development composite index (Government of Malaysia 2006, 356)12) and why UNDP noted that poverty in Malaysia was mainly Bumiputera in ethnic character and had a rural and regional character, with “the indigenous communities in Sabah and Sarawak” being “especially prominent” (UNDP 2007, iii). There are further realities that call into question the overall sustainability of Sarawak’s economic development model, an issue seldom addressed—let alone discussed in depth—by policy makers. A recent social impact assessment of the hitherto nomadic Penan of the Ulu Belaga area affected by the current Murum dam project included the preparation of a “Resettlement Action Plan” (RAP). The RAP noted that their “average cash incomes (from wages and allowances) vary between RM49 and RM272 per household per month” (Chemsian Konsultant Sdn Bhd 2011; Sarawak Energy 2012). Hence, although there has been much progress overall in reducing poverty and inequality under the NEP’s rapid economic growth since 1970, both remain entrenched in Sarawak. Sarawak’s economic growth and pattern of industrialization over the last four decades has also produced a skewed pattern of “unequal development,” a pattern most clearly seen in the exploitation of Sarawak’s rich resource endowments (Aeria 2013). Indeed, an official document leaked from the Sarawak Land and Survey Department to the whistle-blower Web site Sarawak Report details an extensive list of politically well-connected companies, a listing of the who’s who of the political and business elites within the state that have benefited from extremely cheap and even free grants of extensive tracts of land for cash crop plantation farming (especially oil palm) (Sarawak Report, January 28, 2015). Compounding this “unequal development” pattern is Sarawak’s economic path dependence given its over-reliance on primary resource extraction. Sarawak’s relative share of sectoral GDP by industrial origin reflects this. Its reliance on its primary commodity sector averaged around 35 percent in 1967, over 40 percent in the 1970s, and over 50 percent in the 1980s before reducing to 45 percent in 1995, 41 percent in 1997, 47 percent in 2000, 36.3 percent in 2005, and 34.3 percent in 2009 (Department of Statistics, Sarawak, various issues) (see also Table 4). Since timber and petroleum resources are exhaustible and there is concern over finding new sources of growth and revenue, the federal and state governments advocated industrial diversification in 2008 via the development of the multibillion-ringgit SCORE to ensure that the NEP’s objectives of redistribution with continued growth were not jeopardized. Central to the success of the huge developmental corridor was cheap hydroelectric power. For the Sarawak government, SCORE’s launch and eventual success were based on the availability of abundant water resources and suitable hydropower dam sites in the state. The Sarawak Integrated Water Resources Management Master Plan concluded that “hydroelectric power generation [had] particularly highly potential and [was] suitable in Sarawak due to the abundance of water, with an annual precipitation of about 4000 mm” (SIWRM Master Plan 2008). The huge financial resources required to build the initial 13 mega-dams with their spinoff contracts also meant that hydroelectric mega-dam construction and electricity power generation along with hundreds of kilometers of power cable infrastructure would emerge as the state’s new source of economic growth over the next decade. The lead agency for the implementation of SCORE has not been any local government authority but the state government via a powerful statutory agency, the Regional Corridor Development Authority (RECODA). This is due to the unique constitutional characteristics of Sarawak within the federation of Malaysia. The 1963 Malaysia Agreement along with the Federal Constitution accorded the state government of Sarawak (and Sabah) greater control over all its land-based resources and greater autonomy in overseeing economic development than the powers enjoyed by the state governments in Peninsular Malaysia. Principally, this was enshrined in the transfer of federal powers to the state and concurrent lists of governmental powers, which included the unusual power of control over immigration into Sarawak territory, along with additional sources of revenue and special development grants (Lim 1997).17) As well, enshrined in the State List of Powers of the Malaysian Constitution was control over local government and development within its borders. Sarawak is presently divided into 26 local government administrative districts (also known as local councils) made up of city councils, municipal councils, district councils, and one special authority called the Bintulu Development Authority. All these local councils fall under the strict financial and political jurisdiction of the state government’s Ministry of Local Government and Community Development. Local government elections in Sarawak were suspended in 1971 and abolished in 1977, when the state assembly adopted the Local Authority Amendment and the Kuching Municipal Amendment Bills. Since then, all local councilors have been political appointees of the state government. As a result, the only autonomy available to local councils is in the form of planning and management functions related to “conservancy, scavenging, street lighting, road maintenance and to a certain extent matters pertaining to environment and public health” (Sarok 2009, 22) within their areas of jurisdiction. Although local councils collect local taxes, these funds are insufficient to cover all their annual expenses. Hence, nearly all remain dependent on financial grants and transfers from the Sarawak state government. Constitutionally, the Sarawak state government has always enjoyed considerable leeway in undertaking and managing its own development projects and activities, the most recent and important being SCORE. To this end, the state government set up RECODA in 2009 as the sole agency “tasked with overseeing and managing SCORE” (RECODA 2015b). The setting up of RECODA was seen as necessary given the huge size of SCORE. According to official sources, SCORE covers “over 70,000 square kilometres of the resource rich central region” of Sarawak, and it “has a long coastline of more than 1,000 km, over 8 million hectares of forests, almost 5 million hectares of arable land and peat land suitable for agriculture” (RECODA 2015c).18) The corridor has 1.2 billion barrels of known oil reserves; over 80 million tonnes of silica sand; and over 22 million tonnes of kaolin or china clay, a key component of cosmetics, ceramics, and, most recently, combat area medical equipment (RECODA 2015a). Citing Sarawak’s “abundance of natural resources, including clean and safe renewable resources, such as hydropower that offers commercial users clean energy at competitive rates” (ibid. ), policy planners thus earmarked SCORE as the region for the establishment of energy-sector industries. Ten high-impact priority industries19) were identified and a two-decade-long development plan drawn up to realize the state’s industrialization blueprint. SCORE’s geographic reach and its desire for large-scale investments have meant that economic and developmental activities within it often traverse numerous local council jurisdictions. Not only would managing major investors require deft coordination between various state government agencies, but it would also require organization and dexterity when dealing with the many local councils and their various planning and maintenance departments located within SCORE. Hence, the state government established RECODA as an agency tasked with overseeing and managing SCORE in an effort to cut bureaucratic red tape and facilitate foreign and domestic investment. Set up as a one-stop government agency to avoid “traditional government procedural delays” (RECODA 2015b), RECODA is a powerful agency chaired by the chief minister of Sarawak. To ensure efficiency and efficacy, RECODA also has “board representation from all of the relevant federal and state agencies to ensure swift decision making” (ibid.). It has two defined primary tasks. First, RECODA “promotes SCORE by creating and stimulating new and existing markets”; and second, it is tasked with attracting investments and industries to SCORE so as to “achieve the ambitious investment goals set by the state” (ibid.). As noted on its Web site, “in the face of fierce global competition not just from traditional or regional competitors, but also from developed countries, RECODA understands the need for an environment that generates confidence for private and corporate investors” (ibid.). In other words, RECODA was set up to be a “lean and nimble organisation capable of rapid decision-making, fast track approvals and implementation of strategic and tactical initiatives to ensure investors are able to hit the ground running” (ibid.). And yet, precisely because the RECODA board is chaired by the chief minister, the agency is effectively a powerful supra-agency of the state government of Sarawak,20) one that transcends all local government authorities within its geographic sphere of activity. Hence, for all purposes, when we discuss SCORE and the developmental impact of the foreign investments and industries in the corridor, our discussion is focused on the role of the state government and not on local government or local councils, since the latter’s role is minimal. Although local government authorities do operate within the geographical area of SCORE, they essentially act only as providers of public services within their areas of urban and rural jurisdiction,21) with little responsibility over investments, development, and industries related to SCORE. Early in the second decade of this century, SCORE’s industrialization program was valued at US$105 billion and was aimed at transforming and developing the state by the year 2030 (Sovacool and Bulan 2011). The underlying assumption is that accelerated economic growth and development will, ipso facto, improve the quality of life for the people of Sarawak (RECODA 2012). Indeed, SCORE has been touted as “the most capital intensive and ambitious energy project ever undertaken in Southeast Asia” (Sovacool and Bulan 2011) with the “firm belief that a massively increased energy supply will entail economic growth and development” (BMF 2012a). In pursuit of this goal, the 52 HEP dams—including the completed Batang Ai dam, as announced by Abdul Aziz Husain in China in 2007—were conceived on the assumption that Sarawak’s numerous rivers had the potential to produce 28,000 MW of hydropower (ibid. )22) as well as “clean” and cheap energy to power the demands of various heavy industries such as aluminum smelting and steel, which had been identified as the backbone industries within SCORE. Of the 52 major HEP dams planned for the state, 3 have already been completed (Batang Ai, Bakun, and Murum). A fourth (Baram) was under initial phase of construction until its cancellation in early 2016. Seven other HEP dams are in their feasibility planning stages: Limbang, Balleh, Lawas, Belaga, Menjawa, Pelagus, and Punan Bah (SIWRM Master Plan 2008). Another recently completed dam, Bengoh, located about 50 km outside Kuching, is not an HEP dam but one designed to meet the raw water needs of the growing capital city and its hinterlands until 2030. And yet, deep concerns remain that most of these HEP dams are unsustainable and will have a negative impact upon local communities and the environment (Mongabay 2009; BMF 2010, 2012a; 2014). All of these dams have been, or currently are, reliant upon foreign investment or foreign technological expertise for their development. We examine four—namely, Batang Ai, Bakun, Murum, and Baram—to draw lessons from them. It is to these issues that we now turn. Completed in 1985, the 110-meter-high Batang Ai HEP dam “has a water surface area of 84 km2, a water volume of 750 million m3, and a mean depth of 44 m” (Ling et al. 2012). Its reservoir inundated approximately 21,000 acres of land and displaced more than 3,000 indigenous people from some 26 longhouses (Avang 1999; First Peoples Worldwide 2012). Costing US$236 million, it was financed by federal government funds (US$44.8 million) and the Employees Provident Fund23) (US$57.3 million) and received loans of US$44.8 million, US$40.4 million, US$36.3 million, US$9.9 million, and US$2.2 million from the Japanese Overseas Economic Cooperation Fund, the Asian Development Bank, the Mitsui Trust Banking Company (Mitsui), the Australian Export Finance and Insurance Corporation, and the English Export Credit Guarantee Department respectively (Hong 1987, in Avang 1999). According to Sahabat Alam Malaysia (SAM), 22 local indigenous communities were displaced by this project; 10 communities relocated in 1982 and the remaining 12 in 1984 (SAM 1998, in Avang 1999). Other local communities that were not inundated by the dam impoundment either chose to stay or moved to higher ground. They were, nonetheless, also affected, when their traditional transportation routes were cut off by the rising waters of the dam reservoir. Similarly, Avang Itik’s (1999) short study of two indigenous communities to assess the sociocultural impacts of the Batang Ai Hydroelectric Project and its resettlement scheme found that most of those resettled did not have firm resettlement contracts but merely verbal assurances from the government. Land compensation was set at an unrealistically low rate of RM300/acre. On average, those resettled received approximately RM30,000 per family while those who were not resettled received about RM10,000 (Avang 1999). Ngidang (1996), however, states that the “average compensation in the ‘Danger Zone’ area was about RM90,000 per family and about RM62,000 per family in the ‘Partial Danger Zone’” (Ngidang 1996, in Avang 1999). Most of those resettled also did not receive the amount of land promised after they moved from their native customary rights (NCR) lands into the resettlement areas. Many resettlers felt shortchanged by the government. This issue has since consistently been part of election campaign discourses in the parliamentary constituency of Lubok Antu and state constituency of Batang Ai in all elections since the 1990s (Yi 2009). As well, resettlers discovered that with the building of the dam came massive socio-environmental changes that forced major lifestyle changes upon them. They found they had to pay for their new homes, which cost RM36,000 each. Instead of being compensated for the loss of their inundated homes, resettled families found that the government’s compensation of RM8,000 per house was used as a down payment for their new homes, with the government expecting resettled families to pay the difference via monthly installments. Many have been unable to pay. Resettlers also discovered that they had to pay for water and electricity supply despite earlier government promises of free utilities in the resettlement areas. Complicating matters, many also realized that they now lived in a pure cash economy as opposed to their former lives in which they were able to rely upon the forest to supplement their food and other needs. With higher expenses, insufficient income from their land crops, and burdensome debt, a majority of resettlers in Batang Ai have not managed to cope and have not managed to extricate themselves from poverty. Consequently, the Batang Ai HEP dam resettlement has long been regarded as a socioeconomic failure (Ngidang 1996, in Jarrow 2010; The Borneo Post, May 19, 2013), with resettled families having to live in areas with severe environmental and social challenges that place stress upon their lives and their cultural identities (ADB 1999). Environmentally as well, Batang Ai has problems. The inundation of the dam proceeded without its biomass being cleared. Consequently, Batang Ai has already contributed serious levels of hydrogen sulfide and methane into the atmosphere (and continues to do so), with potential impacts on global warming. Absurdly, there have been few studies on the levels of methane and hydrogen sulfide produced in Batang Ai since it was commissioned. As such, little is known about Batang Ai’s damaging global environmental footprint. A recent local study, however, found that Batang Ai continues to produce and harbor copious amounts of toxic hydrogen sulfide in its waters, with levels rising in proportion to water depth (Ling et al. 2012). Although the levels have decreased over the years compared to an earlier study in 1995 (Pusin 1995, in Ling et al. 2012), “the irritating smell of hydrogen sulphide has been detected at the reservoir, at outflow and at a downstream town of Lubok Antu” (Ling et al. 2012, 24). After testing the water, the study found that “58% of the hydrogen sulphide concentrations observed in the various test sites of the dam exceeded US EPA recommended values of 2 μg/L” (ibid., 27). Such concentrations posed a toxic hazard to aquaculture, especially in the event of an “upwelling or mixing of water where the high sulphide level is brought to the culture zone with anoxic water” (ibid.). Although methane is also being produced and emitted at the Batang Ai reservoir, there are as yet no known studies on the levels of methane.26) There are also no publicly available studies on sedimentation, fish migrations, or non-native and invasive species of flora and fauna upstream of the dam. Similarly, no known studies have been undertaken on the impact of changes of downstream river flows upon the natural and human communities and environments of the Batang Ai River. Located on the Balui River, a tributary of the mighty Rejang River, the Bakun HEP dam is the second-highest concrete-faced rockfill dam in the world. With eight power tunnels delivering water to eight 300 MW turbines, Bakun is capable of producing 2,400 MW of electricity (BNHP 2011). Bakun rises to a height of 207 m, has a catchment area of 14,750 km2, and has a reservoir surface area of nearly 700 km2, nearly the surface area of Singapore. Its reservoir fill volume is 16.71 million m3, with a gross storage volume of 43,800 million m3 (EcoKnights 2010). First mooted in the 1960s, work on the controversial HEP dam began in 1986 but was crippled and shelved in 1990, revived in 1993, stopped in 1997, and revived again in 2000, due to a lack of demand for electricity, serious financial constraints, economic recessions, and regional financial crises. The project was finally completed in 2011 when Sinohydro, a state-owned enterprise from China, got involved via a Malaysia-China joint-venture company after various Malaysian public-private joint ventures had failed (International Rivers n.d., Bakun Dam). From design until completion, Bakun saw the involvement of both the federal and state governments and their agencies, major investors, consultants, and contractors, domestic as well as foreign. Both the federal and state governments (along with their agencies) invested huge sums of public funds into Bakun. Some of the better-known domestic agencies/companies that invested resources into the project included Ekran Berhad; Bakun Hydroelectric Corporation (a joint venture comprising Malaysia’s national power corporation, Tenaga Nasional Berhad [TNB]; Sarawak Electricity Supply Corporation [SESCO]; and Malaysia Mining Corporation [MMC]) (Sulaiman 2013). Global Upline Bhd, Sarawak Hidro, and Malaysia-China Hydro JV (comprising Sime Engineering Bhd, Sinohydro Corporation of China, WCT Bhd, MTD Capital, Ahmad Zaki Resources, Syarikat Ismail, and Edward & Sons) were also involved (The Malay Mail, December 1, 2004). All these companies, whether government-linked (e.g., TNB, SESCO, and MMC) or privately owned, were closely connected to various political interests close to the governing coalition (federal and state level) Barisan Nasional or to then Chief Minister Abdul Taib Mahmud and then Prime Minister Dr. Mahathir Mohamad (Gomez 1999; Brown 2001; How et al. 2013).27) Many of these companies had proven track records in completing various large financial, engineering, and construction projects. They also formed the political-economic vanguard of Dr. Mahathir Mohamad’s grand strategy of modernizing Malaysia via industrialization and mega-construction projects (Gomez and Jomo 1997; Milne and Mauzy 1999; Wain 2009). Some of the better-known foreign companies involved with Bakun included SAMA Consortium German Agency for Technical Cooperation, Snowy Mountains Engineering Coporation (Australia), Harza Engineering LP (United States), Swedish-Swiss joint venture Asea Brown Boveri (Switzerland), Companhia Brasileira de Projetos e Obras (Brazil), Lahmeyer (Germany), DongAh (Korea), IMPSA (Argentina), and Alstom (France) (Allison 2000). Bakun has proven controversial. Its sheer size has drawn international odium ever since the World Bank and the World Commission on Dams both eschewed any further involvement with large dams as “dam projects face on average cost-overruns of 56%, that promoters systematically exaggerate benefits and that 55% of the analysed dams generated less power than projected” (BMF 2012a, 7). Officially Bakun cost RM7.4 billion (Sovacool and Bulan 2011; Malay Mail Online, October 2, 2013), although critics suggest the project cost closer to RM15 billion (BMF 2012a; Asia Sentinel, April 24, 2012). The exact total amount of public funds expended for the completion of this project, however, remains unknown. What is known is that the federal government paid about US$250 million compensation to Bakun Hydroelectric Corporation and its foreign contractors, Asea Brown Boveri, Companhia Brasileira de Projetos e Obras, and DongAh of South Korea to rescue the project from its myriad disputes and delays (Allison 2000; Swain and Ang 2004).28) Bakun was ultimately completed with financial support from various Malaysian government pension funds and the China Export Import Bank (International Rivers n.d., Bakun Dam). Such massive expenditures without accountability suggest that when it came to mega-development projects linked to political interests, financial costs were not the priority of the Malaysian government. Instead, crony political business links were. In a 2005 report, Transparency International branded the project “‘a monument of corruption’ citing years of delays, ownership changes and overall costs that more than doubled” (Free Malaysia Today, October 27, 2011). A similar conclusion was reached by Bruno Manser Fonds (2012a) given the numerous politically connected companies involved in the construction of the dam. Indeed, one of the biggest beneficiaries of Bakun was the politically linked company Cahya Mata Sarawak,29) which has long had a monopoly on the supply of cement and steel in the state. In 1996 it expanded its production capacities as a direct response to the building of Bakun (Aeria 2002). Bakun has also been dogged by local and global criticism over the treatment of those resettled. Over 10,000 indigenous people from 15 communities were relocated and resettled on account of the Bakun hydropower project. Although intially given assurances and a raft of promises about a better life and future for their communities in the Bakun Resettlement Area at Sungei Asap, all were eventually shortchanged. Despite the communities being resettled in 1998, compensation for inundated NCR lands was delayed by over 14 years on account of uncertainty over how the compensation was calculated (Netto 1998; The Borneo Post, June 17, 2012) and also because of local disputes over the size of each community’s and individual’s NCR landholdings and among individual claimants (Tawie 2010). Most of those affected by the dam were resettled in a remote area with poor soil (rocky, sandy, and sloping land) in Sungei Asap. Despite the government’s promise of three hectares of adequate land per family, each family was given only three acres of land; this was insufficient for hill rice cultivation (Hornbill Unleashed 2011). All their efforts to plant traditional crops such as pepper, cocoa, dragon fruit, and ginger came to naught since the land was too poor to nurture any crop except oil palm. To add insult to injury, all resettled families were told to pay between RM50,000 and RM60,000 for their individual apartments in the longhouses built for them (The Borneo Post, November 9, 2010). Sungei Asap did have a school, a police post, a health clinic, and an agricultural office. But it still does not have a fire station, a post office, or a bank (SMLD and SALCO 2008). Cut off from their traditional river environments where they had access to fishing and river transportation, forced to settle on poor soil, and constrained to pay for their new apartments in Sungei Asap, the resettled communities were effectively forced by the government into penury and hardship (Malaysiakini, September 17, 2010). In other words, despite rosy official promises that construction of the dam would bring progress and development, once proud and dignified communities have been reduced to working as unskilled labor in nearby oil palm plantations and construction sites and waiting on coffee shop tables in urban areas. Many residents who could not take the “bad living conditions” and the severe stress they encountered in their new lives in the resettlement area moved back to their traditional lands (Malaysiakini, July 6, 2013). The near absence of sustained agricultural activity due to poor soil fertility in Sungei Asap, the absence of nearby markets for the villagers’ meager produce, and “a lack of employment and limited resources in the resettlement” (Jehom 2008, 152) has also meant that many longhouses of the Sungei Asap resettlement village are largely vacant except for a few old people with their grandchildren.30) Adults of working age are rarely seen in Sungei Asap as most of them work as migrant labor in urban centers such as Bintulu, Sibu, Miri, Kota Kinabalu, Kuching, and farther afield in Singapore and Peninsular Malaysia. These migrant workers return only once or twice a year, during festive periods. This serious labor outflow from rural areas to urban centers is made worse on account of the lack of waged employment in Sungei Asap, low wages, and poor educational achievement of the resettled communities (Baru 2012; The Borneo Post, June 17, 2012). Those who remain in Sungei Asap “imply a disappointment with the resettlement” (SMLD and SALCO 2008, 54). Along with unhappy Sungei Asap residents who moved back into their traditional homelands, there were about 189 families from five longhouses within the Bakun catchment who refused to move to Sungei Asap. All these people moved to higher grounds on their NCR lands that lay within the Bakun reservoir and catchment area (Malaysiakini, September 28, 2010). These higher grounds, hilltops, soon became islands (hilltop-islands) within the Bakun reservoir once the dam was impounded to its full capacity. Consequently, many of these indigenous communities now live on homemade houseboats (jelatongs)—built with floating logs and large plastic jerry cans—in the dam reservoir lake or tributaries, their houseboats tethered to their hilltop-island NCR lands. Visits to the hilltop-island jelatongs confirm that these floating communities, with a total population numbering in the hundreds (Malaysiakini, July 6, 2013), do not have access to any clean water, electricity, fuel, sanitation, or public services. Located hours away by boat from the dam, these communities face lives that are “deplorable and inhumane” (Kedit 2012). They rely completely on rainwater, as the reservoir water is “polluted, foul-smelling and muddy. Their only source of clean water is from heaven; rain-water collected in plastic tanks fitted with piping to supply the main hut” (ibid.). There are public health signs warning these communities against drinking or swimming in the reservoir water “because of the risk of Melioidosis and Leptospirosis” (Sarawak Report, November 25, 2012). Toilets are holes cut into the floor of the jelatongs that empty straight into the dam. The only source of electricity is generator sets powered by gasoline, which has to be purchased from shops near the dam, hours away by boat—a dam that produces surplus energy that the communities cannot access (ibid.). Given their remote location, children in these communities do not have access to schools. Nor do the sick have access to health clinics or hospitals. As for food, the jelatong communities cultivate hill rice on nearby hilltop-islands. And they have a plentiful supply of fish, although little is known about how healthy these fish are. Comprehensive studies on the health and nutritional status of these impoverished and marginalized communities are currently lacking. Adding to the woes of these remote jelatong communities are plans by the state government to gazette their watery homelands and adjoining hilltop-islands into a “Bakun Islands National Park.” A total of 18 islands within the Bakun dam area are affected (Malaysiakini, July 6, 2013). Effectively, this action will deprive all the remaining indigenous communities living within the Bakun reservoir area of their NCR rights and privileges (ibid.) as well as access to agricultural lands and fishing grounds, since such activities would not be allowed in a national park. Instead, the islands in the park “would eventually be developed into eco-tourism areas so that the locals can venture into the tourism sector” (The Borneo Post, March 1, 2012). The local state assemblyman and Assistant Minister of Culture and Heritage Liwan Lagang pledges to safeguard the rights of local people affected by this National Park gazettement since the decision to gazette the islands was really to “preserve them for the benefit of all the people affected by the Bakun dam” (The Borneo Post, July 8, 2013). There were no readings taken of methane and hydrogen sulfide levels in this study, although the “rotten egg smell of hydrogen sulfide was detected during sampling” (ibid., 94). The extent of these gas emissions and its huge global environmental footprint thus remain unknown, although the pervasive stench of hydrogen sulfide even kilometers away from the dam and its reservoir suggests large volumes of emissions. International Rivers, a global NGO that campaigns against mega-dams, suggests that the water in Bakun’s reservoir is saturated with nitrogen on account of a large amount of inundated biomass and fertilizer runoff from the huge oil palm plantations above the reservoir. These nitrogen deposits have reportedly made the waters of Bakun acidic and have begun to corrode the power turbines (International Rivers n.d., Bakun Dam). Lee et al., however, suggest that the low pH values of the Bakun reservoir are likely due to “sulphide oxidising into sulphuric acid” (Lee et al. 2012, 94). Whatever the case, there is little doubt that the high level of acidity does have an impact. The Bakun reservoir is presently unsuitable for “aquaculture due to the anoxic condition at such a shallow depth, low pH and high turbidity” (ibid., 92). However, as in the case of Batang Ai, there are no presently known or publicly available comprehensive studies of the impact of the Bakun reservoir or water flow upon the downstream riparian environment, upon the flora and fauna of the river, or upon nearby human settlements that rely upon the river. Nonetheless, taken as a whole, one can surmise that the traditional lifestyles and cultural heritage of the tribal communities of the Balui River that were once intricately linked to their forest environment have been transformed drastically by the very dam that was supposed to bring them “development.” As well, despite the claims of the environmental friendliness of hydropower, the reality is that the Bakun dam produces huge amounts of methane, hydrogen sulfide, and carbon dioxide from all the inundated rotting biomass—gases that probably have a very high global environmental cost given their impact upon the ozone layer and contribution to global warming and climate change. Keen on securing electricity power supply for SCORE’s reportedly many industrial investors, especially large aluminum smelters, the Sarawak government commissioned the Murum and Baram dams in 2008 and 2013 respectively. Reportedly, no social or environmental impact assessments were undertaken until after the dam project was commissioned, and none have been made publicly available. The Resettlement Action Plan (RAP) for Murum was also commissioned after the Murum dam project began, in complete defiance of all internationally recognized protocols governing the resettlement and treatment of indigenous peoples (International Rivers 2012; Sarawak Report, September 28, 2012). The UNDRIP37) explicitly requires that indigenous peoples be fully consulted and development plans disclosed before any construction begins. Built along the Murum River above the Bakun dam, the Murum dam has submerged eight Penan settlements totaling about 1,500 persons, forcing these semi-nomadic peoples into giving up their traditional forest-related lifestyles (International Rivers n.d., Murum Dam). Complicating matters has been the fact that the RAP proposed pitiful compensation for those to be resettled, granting them a mere RM500/month per family for four years. The RAP assumed that those resettled would by then be able to carve out their own livelihoods. The RAP did not take into account that the alternative lands the Penan were to be resettled upon, namely, the Tengulang and Metalun resettlement areas, had already been allocated to various large commercial oil palm plantation companies. Cultivation of oil palm in these areas has already begun, raising concerns about whether the 14 hectares of land supposed to be allocated to each resettled family under the RAP will even materialize. The secrecy and lack of disclosure evident in the Murum RAP thus raised questions about whether all the development proposals for new resettlement townships in Tengulang and Metalun were going to materialize. In the light of the poor resettlement schemes of Batang Ai and Bakun, Sarawak Energy has been accused of human rights violations, land theft, and the institutionalization of poverty under the guise of development promises (BMF 2012a; Sarawak Report, September 28, 2012). Hence, when news leaked in late 2012 that the Sarawak government and Sarawak Energy Berhad were going ahead with the construction of the 1,200 MW Baram dam, it sparked large and sustained protests from numerous communities in the Ulu Baram region, where the dam is to be built. Once completed, the Baram dam reservoir, covering approximately 388 km2, will submerge 26 villages and displace over 20,000 indigenous people. Access roads are already being built to the dam site even as social and environmental impact assessments are being undertaken. In other words, the decision to go ahead with the Baram dam paid scant respect to the interests and livelihoods of the indigenous communities that would be affected by the dam. Members of the native communities of the Baram River basin blockaded the access roads to the Baram dam site (Sarawak Report 2014). Such a dismissive approach toward the local community gave rise to a social movement against not only the Baram dam but all the other 52 dams proposed in Sarawak. Save Rivers, a coalition of local NGOs and individuals, has actively campaigned against the Baram dam and in favor of saving all Sarawak’s rivers from being dammed up for hydropower. Although not very successful, its vigorous press campaign in Australia against Hydro Tasmania (an Australian company and Sarawak Energy’s strategic partner in the construction of the Baram dam project) did lead to the withdrawal of Hydro Tasmania from the Baram project (BMF 2012b).38) Other companies, such as SMEC, GHD (both from Australia), MWH Global (United States), Fichtner Gmbh (Germany), and Norconsult (Norway), that conducted feasibility studies for the dams have also come under fire (BMF 2012a). As well, protests at the International Hydropower Association’s congress in Sarawak in May 2013 (Save Rivers 2013b) questioned the global association’s commitment to sustainable use of hydropower (Save Rivers 2013a). It seems that downstream investors in SCORE (and the accompanying spin-off benefits to local investors) are more important to the state government than the forests, the rivers, and the overall physical environment that supports the lives and livelihoods of its own indigenous peoples. Since its establishment, SCORE has grown with the involvement of various local and foreign investors. No exact figures are available on the total amount of investment poured into SCORE. However, five key investors have already set up factories and smelters in SCORE, principally in the Samalaju Industrial Park. Four are major foreign investors, while the fifth is a Malaysian company (see Table 5). The third-largest mining conglomerate in the world, Australian-owned Rio Tinto, abandoned its plan to set up a US$2 billion joint-venture aluminum smelter in Sarawak. It pulled out of SCORE in March 2012 after failing to come to an agreement over “commercial power supply terms” with Sarawak Energy Bhd (Free Malaysia Today, March 27, 2012). Apart from such environmental fears, SCORE also does not inspire investor confidence. Specifically, although there is an availability of excess power from Bakun, there are serious investor concerns that supply is not guaranteed. This has raised the risk profile for investors in SCORE. In late June 2013, a major power outage that originated with the Bakun HEP dam led to a complete failure of the electrical grid throughout the state (New Straits Times, June 28, 2013; The Borneo Post, June 28, 2013). This power outage caused major damage to the Press Metal aluminum smelter, when loss of power for almost six hours caused “solidification in the reduction cells of all its potlines” (PMB 2013). This shutdown of Press Metal’s aluminum production lines forced the 120,000 tonne/annum facility to shut down production for six months for reconstruction works. Press Metal’s profits and credibility took a major hit, with its 2013 net profit estimated to fall to RM36.6 million from RM138.4 million previously (The Star, July 3, 2013). Businesses throughout the state of Sarawak (along with two million residents) also were badly affected by the power outage, with damage estimated at hundreds of millions of ringgit—a situation made worse when one realizes that all the HEP dams in the state were built with public funds with the expressed aim of ensuring a stable power supply. Sarawak’s economic dynamism and growth pattern have dramatically reduced poverty and hard-core poverty levels. Nevertheless, they have not eliminated poverty. Indeed, Sarawak’s current pattern of development has seen persistent poverty, deepening inequality, and environmental degradation amidst the emergence of a small nouveau riche class closely associated with the state’s political elite (Aeria 2002; 2013; Straumann 2014). With its publicly articulated desire to diversify and grow its economy, in 2008 the Sarawak state government embarked upon a massive industrialization drive that had at its center large-scale industry in an industrial corridor called SCORE. This diversification drive is premised on the supply of renewable energy, primarily HEP, to huge energy-guzzling industrial complexes in central Sarawak such as manganese, silicon, and aluminum smelters. The idea is that access to cheap, green, renewable energy should allow the state to build up its industry and grow the economy, increase employment, scale up technology, enhance education tailored to industrial needs, and so forth. Ipso facto, all this would soon lead to economic growth, social welfare improvements, and development for all. The problem is that the number and size of all the proposed HEP dams are huge. Those built have already displaced thousands of indigenous peoples and their communities into new resettlements, which has left them significantly worse off than before. And this after the forests of Sarawak were already decimated by logging and land clearing for the establishment of oil palm plantations. Central to the plight of all these displaced indigenous peoples has been the attitude of the Sarawak government, which has consistently refused to recognize the environment as a sustainable resource with a limited carrying capacity and has refused to be inclusive in its dealings with indigenous communities despite all its rhetoric about adhering to international protocols and internationally binding conventions that govern development interventions and interactions with indigenous peoples. This patronizing and prejudiced outlook toward ordinary native landowners and the forest environment is largely explained by the nexus of close linkages that bind key politicians in the state administration with crony businesses via state patronage in the form of timber concessions, land grants, and infrastructure contracts that have proven to be environmentally destructive. Sarawak’s over-reliance on resource-based extractive industries and capital-intensive industries has thus generated huge profits for their owners and their political associates but has been destructive to the forest environment. The model of NEP development in the state (of which state patronage is central) over the years has brought about unequal development and path dependence. As well, the state’s advocacy of “clean and green energy” in the form of 52 HEP mega-dams to power heavy industrialization in SCORE has complicated the development of policy options that prioritize environmental and economic sustainability. Although rhetoric within the state administration has prized long-term economic growth, the reality is that state capture by key crony political-economic interests has more often than not seen them influence and subsequently derive exclusive benefit from the outcomes of development plans and economic decisions taken by key politicians in the state. The advocacy of HEP dam development to access a large source of “cheap and renewable” energy for heavy industries with their accompanying pollution has brought about further environmental problems. The huge release of greenhouse gases from the numerous dams is already contributing toward ozone depletion, global warming, and climate change. Further dam development can only make things worse. One is thus constrained to surmise that Sarawak’s unilinear and path-dependent approach toward development that prioritizes large-scale infrastructure-led industrialization projects is environmentally unsustainable and economically unjust since it is largely self-serving for the political-business elites of the state. Although this approach is viewed as a panacea in the state’s drive for growth and development, it is a chimera since it eschews any serious responsibilities toward husbanding natural resources or caring for the environment (local and global), and it has a deep-rooted callous disregard for the interests and livelihoods of the state’s indigenous peoples. It is a recipe for an unfolding disaster. In late July 2015, owing to intense pressure from widespread grassroots opposition against the building of the Baram dam led by Save Rivers (a local nongovernmental organization), Chief Minister Adenan Satem announced a moratorium on the building of the Baram Dam. In early 2016, as the 11th state elections approached and having an eye on winning as many seats as possible, the chief minister once again reiterated his commitment to the moratorium. Although there was initial skepticism over this moratorium (since the Bakun dam had been shelved twice—in 1990 and 1997—before finally being built), the cancellation of the Baram dam was confirmed when the state government published a notice in the Sarawak Government Gazette on February 18, 2016 that officially revoked and repealed its gazette of September 5, 2013 acquiring all native lands earmarked for the dam project (Save Rivers, March 21, 2016). Abdul Aziz Husain. 2007. Chinese Power Plants in Malaysia: Present & Future Development. Paper presented at the “China—ASEAN Power Corporation and Development Forum,” Nanning, Guangxi, China, October 28–29. Abdul Majid Mat Salleh; Hatta Solhee; and Mohd. Yusof Kasim, eds. 1990. Socio-economic Development in Sarawa: Policies and Strategies for the 1990s. Kuching: Angkatan Zaman Mansang. Aeria, Andrew. 2013. Skewed Economic Development and Inequality: The New Economic Policy in Sarawak. In The New Economic Policy in Malaysia: Affirmative Action, Ethnic Inequalities and Social Justice, edited by Edmund Terence Gomez and Johan Savaranamuttu, pp. 117–147. Petaling Jaya and Singapore: SIRD and NUS Press. ―. 2002. Politics, Business, the State and Development in Sarawak, 1970–2000. PhD dissertation, University of London. Allison, Tony. 2000. Malaysia’s Bakun Project: Build and Be Damned. Asia Times. October 28.
http://www.atimes.com/reports/BJ28Ai01.html, accessed September 18, 2014. Asian Development Bank (ADB). 1999. Special Evaluation Study on the Social and Environmental Impacts of Selected Hydropower Projects. http://www.adb.org/sites/default/files/evaluation-document/35473/files/ss-36.pdf, accessed November 1, 2012. ASNB. 2015. Prospectus & Product Highlights Page. http://www.asnb.com.my/v3_/asnbv2_2funds_EN.php#asn, accessed September 9, 2014. Avang Itik. 1999. Report on Short Visit to Two Long Houses in Batang Ai. November 19. www.rengah.c2o.org/pdf/batang.pdf, accessed November 7, 2012. Bakun National Hydroelectric Project (BNHP). 2011. Welcome to Bakun Hydroelectric Dam Malaysia. http://www.bakundam.com/home.html, accessed November 1, 2012. Baru Bian. 2012. The Hardships Faced by Sarawakian Workers. Press Conference Statement. March 16. Parti Keadilan Rakyat Sarawak. http://www.barubian.net/2012/03/hardships-faced-by-sarawakian-workers.html, accessed November 7, 2012. Bevis, W. W. 1995. Borneo Log: The Struggle for Sarawak’s Forests. Seattle and London: University of Washington Press. Bhagwati, J. N. 1982. Directly Unproductive, Profit-seeking (DUP) Activities. Journal of Political Economy 90: 988–1002. Brown, David W. 2001. Why Governments Fail to Capture Economic Rent: The Unofficial Appropriation of Rain Forest Rent by Rulers in Insular Southeast Asia between 1970 and 1999. PhD dissertation, University of Washington. http://www.reocities.com/davidbrown_id/TOC.htm, accessed November 11, 2012. Bruno Manser Fonds (BMF). 2014. The Risks of Investing in SCORE and Sarawak Dams. http://www.stop-corruption-dams.org/resources/BMF_2014_risks_of_investing_in_Sarawak.pdf, accessed March 31, 2015. ―. 2013a. Exclusive: Sarawak Dams to Flood 2,300 km2 of Rainforests, Displace Tens of Thousands of Natives. 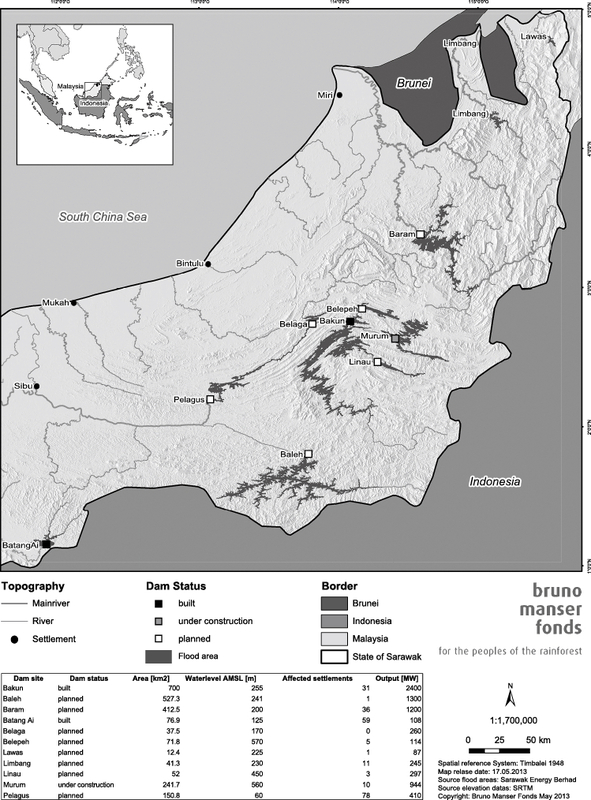 https://www.facebook.com/notes/bruno-manser-fonds/exclusive-sarawak-dams-to-flood-2300-km2-of-rainforests-displace-tens-of-thousan/539676986071755, accessed September 8, 2014. ―. 2013b. Flood Areas of Sarawak Dam Projects. http://www.stop-corruption-dams.org/resources/Sarawak_12_Dams.pdf, accessed September 8, 2014. ―. 2013c. Sarawak Energy Awarded US$226 Million in Contracts to Malaysian Chief Minister’s Family. http://www.bmf.ch/en/news/sarawak-energy-awarded-us-226-million-in-contracts-to-malaysian-chief-ministers-family, accessed September 8, 2014. ―. 2012a. Sold Down the River: How Sarawak Dam Plans Compromise the Future of Malaysia’s Indigenous Peoples. http://www.stop-corruption-dams.org/resources/Sold_down_the_river_BMF_dams_report.pdf, accessed September 8, 2014. ―. 2012b. Norwegian CEO’s Job on the Line after Sarawak Energy Loses Crucial Australian Support. https://www.facebook.com/notes/save-rivers/norwegian-ceos-job-on-the-line-after-sarawak-energy-loses-crucial-australian-sup/549020901793599, accessed September 8, 2014. ―. 2010. Malaysia and China Sign US$11 Bn Power Deal That Involves the Displacement of 608,000 Borneo Natives. October 13. http://brimas.www1.50megs.com/BMF_13Jan10.pdf, accessed September 8, 2014. Bryan, J.; Shearman, P.; Asner, G. et al. 2013. Extreme Differences in Forest Degradation in Borneo: Comparing Practices in Sarawak, Sabah, and Brunei. PLOS ONE (Public Library of Science) 8 (7): 1–7. Bugo, Hamid. 1984. The Economic Development of Sarawak: The Effect of Export Instability. Kuching: Summer Times. Chemsian Konsultant Sdn Bhd. 2011. MURUM Hydroelectric Power Project Resettlement Action Plan: Final Report. November. http://www.stop-corruption-dams.org/resources/Murum_RAP_November_11.pdf, accessed December 14, 2012. China Institute of Water Resources and Hydropower Research (CIWRHR). 2009. Batang Ai Hydroelectric Extension Project. http://www.iwhr.com/english/newsview.asp?NewsID=21065, accessed November 1, 2012. Cleary, Mark; and Eaton, Peter. 1995. Borneo: Change and Development. Kuala Lumpur: Oxford University Press. Coalition of Concerned NGOs on Bakun (Gabungan), Malaysia. 1999. The Resettlement of Indigenous People Affected by the Bakun Hydro-Electric Project, Sarawak, Malaysia. http://www.internationalrivers.org/files/attached-files/resettlement_of_indigenous_people_at_bakun.pdf, accessed November 2, 2012. Colchester, Marcus. 1989. Pirates, Squatters and Poachers: The Political Ecology of Dispossession of the Native Peoples of Sarawak. London: Survival International & Institute of Social Analysis. Department of Statistics, Malaysia. 1995. Population and Housing Census Malaysia 1991: General Report of the Population Census, Vol. 1. Kuala Lumpur: Department of Statistics. Department of Statistics, Sarawak. Various years. Yearbook of Statistics, Sarawak. Kuching: Department of Statistics Malaysia, Sarawak. EcoKnights. 2010. The Dummies Guide to the Bakun Dam. http://www.ecoknights.org.my/resources/education-a-people/864-the-dummies-guide-to-the-bakun-dam.html, accessed November 2, 2012. Evans, Peter B. 1995. Embedded Autonomy: States and Industrial Transformation. Princeton: Princeton University Press. First Peoples Worldwide. 2012. Malaysian Indigenous Communities Demand Referendum on Mega-Dams. www.firstpeoples.org/wp/tag/batang-ai/, accessed November 14, 2012. Gomez, Edmund T. 1999. Chinese Business in Malaysia: Accumulation, Ascendance, Accommodation. Hawaii: University of Hawai‘i Press. Gomez, Edmund T.; and Jomo K. S. 1997. Malaysia’s Political Economy: Politics, Patronage and Profits. Cambridge: Cambridge University Press. Government of Malaysia. 2010. Tenth Malaysia Plan, 2011–2015. Putrajaya: Economic Planning Unit, Prime Minister’s Department. ―. 2008. Mid-term Review of the Ninth Malaysia Plan. Putrajaya: Economic Planning Unit, Prime Minister’s Department. ―. 2006. Ninth Malaysia Plan, 2006–2010. Putrajaya: Economic Planning Unit, Prime Minister’s Department. ―. 1996. Seventh Malaysia Plan, 1996–2000. Kuala Lumpur: National Printing Department. ―. 1993. Mid-term Review of the Sixth Malaysia Plan, 1991–1995. Kuala Lumpur: National Printing Department. ―. 1991. Sixth Malaysia Plan, 1991–1995. Kuala Lumpur: National Printing Department. ―. 1989. Mid-term Review of the Fifth Malaysia Plan, 1986–1990. Kuala Lumpur: National Printing Department. ―. 1986. Fifth Malaysia Plan, 1986–1990. Kuala Lumpur: National Printing Department. ―. 1984. Mid-term Review of the Fourth Malaysia Plan, 1981–1985. Kuala Lumpur: Government Printers. ―. 1981. Fourth Malaysia Plan, 1981–1985. Kuala Lumpur: National Printing Department. ―. 1976. Third Malaysia Plan, 1976–1980. Kuala Lumpur: Government Press. ―. 1973. Mid-term Review of the Second Malaysia Plan, 1971–1975. Kuala Lumpur: Government Press. ―. 1971. Second Malaysia Plan, 1971–1975. Kuala Lumpur: Government Press. Hong, Evelyn. 1987. Natives of Sarawak: Survival in Borneo’s Vanishing Forests. Penang: Institut Masyarakat. Hornbill Unleashed. 2011. Bakun: Empty Promises, Damned Lives. https://hornbillunleashed.wordpress.com/2011/01/18/13687/, accessed November 14, 2012. How, Janice; Verhoeven, Peter; and Effiezal Aswadi Abdul Wahab. 2013. Institutional Investors, Political Connections and Analysts Coverage in Malaysia. http://www.apira2013.org/proceedings/pdfs/K084.pdf, accessed March 14, 2015. IDEAL. 1999. Tanah Pengidup Kitai: Our Land Is Our Livelihood. Sibu: IDEAL Time Sdn Bhd. International Rivers. 2012. Sarawak Energy Publishes “Facts” about the Murum Dam. http://www.stop-corruption-dams.org/resources/Commentary_on_SEB_Factsheet_on_Murum_Dam___Oct_2012_.pdf, accessed September 9, 2014. ―. n.d. Bakun Dam. http://www.internationalrivers.org/campaigns/bakun-dam, accessed September 9, 2014. ―. n.d. Murum Dam. http://www.internationalrivers.org/campaigns/murum-dam, accessed September 9, 2014.
International Tropical Timber Organisation (ITTO). 1990. Report Submitted to the International Tropical Timber Council: “The Promotion of Sustainable Forest Management: A Case Study of Sarawak, Malaysia.” Yokohama: ITTO. Jackson, James C. 1968. Sarawak: A Geographical Survey of a Developing State. London: University of London Press. Jarrow, Roselind. 2010. Settlers Need Sustainable Economic Activities. Free Malaysia Today News. July 13. http://archive.freemalaysiatoday.com/fmt-english/politics/sabah-and-sarawak/7896-settlers-need-sustainable-economic-activities, accessed November 1, 2012. Jehom, Welyne Jeffrey. 2008. Resettlement and Displacement: Kenyah-Badeng of Sg. Asap Resettlement, Belaga, Sarawak, Malaysia. PhD dissertation, University of Bonn. Jomo K. S.; Chang, Y. T.; Khoo, K. J. et al. 2004. Deforesting Malaysia: The Political Economy and Social Ecology of Agricultural Expansion and Commercial Logging. London: Zed Books; Geneva: UNRISD. Kaur, Amarjit. 1998a. Economic Change in East Malaysia: Sabah and Sarawak since 1850. Basingstoke, Hampshire: Macmillan; New York: St. Martin’s Press. ―. 1998b. A History of Forestry in Sarawak. Modern Asian Studies 32(1): 117–147. Kedit, Vernon. 2012. In Deepest Reaches of Sarawak, Abject POVERTY & POLLUTION Greet Baru Bian & PKR. Hornbill Unleashed. November 4. http://hornbillunleashed.wordpress.com/2012/11/04/37008/, accessed November 7, 2012. Krueger, Anne O. 1974. The Political Economy of the Rent-Seeking Society. American Economic Review 64: 291–303. Lande, Carl H. 1964. Leaders, Factions, and Parties: The Structure of Philippine Politics. Monograph No. 6. New Haven: Yale University Southeast Asia Studies. Lee, Nyanti; Ling, Teck Yee; and Jongkar Grinang. 2012. Physico-chemical Characteristics in the Filling Phase of Bakun Hydroelectric Reservoir, Sarawak, Malaysia. International Journal of Applied Science and Technology 2(6): 92–101. http://www.ijastnet.com/journals/Vol_2_No_6_June_2012/15.pdf, accessed November 14, 2012. Leigh, Michael B. 1991. Money Politics and Dayak Nationalism: The 1987 Sarawak State Election. In Images of Malaysia, edited by Muhammad Ikmal Said and Johan Savaranamuttu, pp. 180–202. Kuala Lumpur: Persatuan Sains Sosial Malaysia. ―. 1979. Is There Development in Sarawak? Political Goals and Practice. In Issues in Malaysian Development, edited by James C. Jackson and Martin Rudner, pp. 339–374. Singapore: Heinemann. Liew, Chin Fah. 2007. Sustainable Forest Management in Sarawak. Sarawak Forestry Corporation Presentation to the European Union. January 17. http://www.sarawaktimber.org.my/timber_issue/1205742000-SFM_to_EU.pdf, accessed November 1, 2013. Lim, Hong Hai. 1997. Sabah and Sarawak in Malaysia: The Real Bargain or What Have They Gotten Themselves Into? Kajian Malaysia 15 (1 and 2): 15–56. Ling, Teck Yee; Paka, Debbie D.; Lee Nyanti; Norhadi Ismail; and Emang, Justin J. J. 2012. Water Quality at Batang Ai Hydroelectric Reservoir (Sarawak, Malaysia) and Implications for Aquaculture. International Journal of Applied Science and Technology 2(6): 23–30. http://www.ijastnet.com/journals/Vol_2_No_6_June_2012/5.pdf, accessed November 14, 2012. Majid-Cooke, Fadzilah. 1999. The Challenge of Sustainable Forests: Forest Resource Policy in Malaysia, 1970–1995. Sydney: Allen & Unwin; Honolulu: University of Hawai‘i Press. ―. 1997. The Politics of “Sustainability” in Sarawak. Journal of Contemporary Asia 27(2): 217–241. Malaysian Rating Corporation Berhad. 2015. Economic Research: The State of Sarawak. Kuala Lumpur: Malaysian Rating Corporation Berhad. Mason, Richard. 1995. Parti Bansa Dayak Sarawak and the Sarawak State Elections of 1987 and 1991. Kajian Malaysia 13(1): 26–58. Mersat, Neilson. 2005. Politics and Business in Sarawak, 1963–2004. PhD dissertation, Australian National University. Milne, R. S. 1973. Patrons, Clients and Ethnicity: The Case of Sarawak and Sabah in Malaysia. Asian Survey 13(10): 891–908. Milne, R. S.; and Mauzy, Diane K. 1999. Malaysian Politics under Mahathir. London and New York: Routledge. Mongabay. 2009. Power, Profit, and Pollution: Dams and the Uncertain Future of Sarawak. http://news.mongabay.com/2009/0903-moses_sarawak_dams.html, accessed November 2, 2012. Netto, Anil. 1998. Development Bulletin-Malaysia: Resettlement Continues in Bakun Dam Project. http://ipsnews2.wpengine.com/1998/12/development-bulletin-malaysia-resettlement-continues-in-bakun-dam-project/, accessed November 2, 2012. Ngidang, Dimbab. 1996. Batang Ai Hydropower Resettlement Scheme. In Resettlement and Development in Sarawak: Experiences and Future Trends, edited by Hatta Solhee et al., pp. 18–32. Kuching: Angkatan Zaman Mansang Sarawak. Ooi, Keat Gin, ed. 2004. Southeast Asia: A Historical Encyclopedia from Angkor Wat to East Timor. Santa Barbara: ABC-CLIO, Inc.
―. 1997. Of Free Trade and Native Interests: The Brookes and the Economic Development of Sarawak, 1841–1941. Kuala Lumpur: Oxford University Press. Peoplesdocumentary. 2012. Pollution from Aluminium Smelting Plant at Balingian, Mukah. http://www.youtube.com/watch?v=8wJJx2ng-Yo, accessed October 11, 2014. Permodalan Nasional Berhad [National Equity Corporation] . 2013. Laporan tahunan ASNB bagi tahun kewangan berakhir 31 Disember 2012 [Annual report of ASNB for the financial year ended December 31, 2012]. Kuala Lumpur: PNB. Phoa, John. 2003. The Political Economy of Sarawak’s Timber Industry and Its Impact on the Indigenous Peoples. PhD dissertation, University of Malaya. Press Metal Berhad (PMB). 2013. Power Outage Incident at Its Smelting Plant in Mukah, Sarawak. http://www.bursamalaysia.com/market/listed-companies/company-announcements/1338685, accessed May 28, 2014. ―. 2010. Sale and Purchase Agreement and Shareholders’ Agreement between Press Metal Berhad and Sumitomo Corporation in Respect of Press Metal Sarawak Sdn Bhd. http://announcements.bursamalaysia.com/edms/edmswebh.nsf/all/482576120041BDAA482577AC003E20CA/$File/PRESS%20METAL%20BERHAD.pdf, accessed November 9, 2012. Reece, R. H. W. 1988. Economic Development under the Brookes. In Development in Sarawak, edited by R. A. Cramb and R. H. W. Reece, pp. 21–34. Melbourne: Centre of Southeast Asian Studies, Monash University. Regional Corridor Development Authority (RECODA). 2015a. What Is SCORE? http://www.recoda.com.my/invest-in-score/what-is-score/, accessed March 31, 2015. ―. 2015b. What Is RECODA? http://www.recoda.com.my/about-recoda/what-is-recoda/, accessed March 31, 2015. ―. 2015c. SCORE Areas. http://www.recoda.com.my/invest-in-score/score-areas/, accessed March 31, 2015. ―. 2015d. Priority Sectors. http://www.recoda.com.my/priority-sectors/, accessed March 31, 2015. ―. 2013. Investors. http://www.recoda.com.my/invest-in-score/investors/, accessed December 14, 2014. ―. 2012. Sarawak Corridor of Renewable Energy. www.sarawakscore.com.my/modules/recoda/, accessed December 14, 2014. Ross, Michael L. 2001. Timber Booms and Institutional Breakdown in Southeast Asia. Cambridge: Cambridge University Press. Sarawak Energy. 2014. Sarawak Energy Signs with Sinohydro-Trenergy JV for 500 kV Backbone Transmission Works (Packages B & C). http://www.sarawakenergy.com.my/index.php/news-events-top/latest-news-events/latest-media-release/631-sarawak-energy-signs-with-sinohydro-trenergy-jv-for-500kv-backbone-transmission-works-packages-b-c, accessed September 10, 2014. ―. 2013. About Us. Syarikat Sesco Berhad. http://www.sarawakenergy.com.my/index.php/about-us/subsidiaries/syarikat-sesco-berhad, accessed September 10, 2014. ―. 2012. Murum Dam Fast Facts. http://www.stop-corruption-dams.org/resources/Murum_QA_October.2012.pdf, accessed September 10, 2014. Sarawak Government. 2014. Press Statements Related to SCORE. http://www.sarawak.gov.my/web/home/search/?keyword=score&cat=, accessed September 10, 2014. Sarawak Integrated Water Resources Management (SIWRM) Master Plan. 2008. Hydroelectric Power Dams in Sarawak. www.siwrs.com.my/modules/iwrm/page.php?id=8&menu_id=0&sub_id=3, accessed November 10, 2012. Sarawak Ministry of Land Development (SMLD) and Sarawak Aluminium Company (SALCO). 2008. Joint Survey and Assessment: Opportunities and Constraints Governing the Ways SALCO Smelter Project Might Benefit the People of Sungai Asap. SMLD & SALCO. Mimeo. Sarawak Report. 2014. Baram Dam Blockade. http://www.sarawakreport.org/baram/issue, accessed September 22, 2014. Sarok, Ahi. 2009. Quality Management in Local Government Administration in Sarawak: Process, Implementation and Customers’ Perceptions. PhD dissertation, University of Malaya. SarVision. 2011. Impact of Oil Palm Plantations on Peatland Conversion in Sarawak 2005–2010. Summary Report. January 25. Wageningen: SarVision. http://www.wetlands.org/Portals/0/publications/Report/Malaysia%20Sarvision.pdf, accessed November 21, 2012. Save Rivers. 2016. Surprise Change of Event for Baram Dam. Save Rivers press statement. March 21. ―. 2013a. NGO letter to IHA. April. http://borneoproject.org/wp-content/uploads/NGO-letter-to-IHA_April-2013.pdf, accessed November 30, 2013. ―. 2013b. 300 Indigenous People Protest Dams outside the International Hydropower Association’s Congress at the Borneo Convention Center. https://www.facebook.com/notes/save-rivers/300-indigenous-people-protest-dams-outside-the-international-hydropower-associat/629818107047211, accessed November 30, 2013. Scott, James C. 1972. Patron-Client Politics and Political Change in Southeast Asia. The American Political Science Review 66(1): 91–113. Shireen Mardziah Hashim. 1998. Income Inequality and Poverty in Malaysia. Lanham: Rowman & Littlefield. SMEC Malaysia. 2007–12. Batang Ai Hydroelectric Scheme (Years 1977–87). www.smecmal.com.my/projects_detail.php?subaction=showfull&id=1196950865&archive=&st, accessed December 30, 2013. Soda, Ryoji. 2001. Rural-Urban Migration of the Iban of Sarawak and Changes in Long-house Communities. Geographical Review of Japan 74(1): 92–112. Sovacool, Benjamin K.; and Bulan, L. C. 2011. Meeting Targets, Missing People: The Energy Security Implications of the Sarawak Corridor of Renewable Energy (SCORE). Contemporary Southeast Asia 33(1): 56–82. http://muse.jhu.edu/login?auth=0&type=summary&url=/journals/contemporary_southeast_asia_a_journal_of_international_and_strategic_affairs/v033/33.1.sovacool.pdf, accessed November 17, 2012. Straumann, Lukas. 2014. Money Logging: On the Trail of the Asian Timber Mafia. Basel: Bergli Books. Sulaiman Kadikon. 2013. The Bakun Hydro Electrical Project (HEP), Sarawak, Malaysia: The Manifestation of Islamic System between Environment and Development. https://hydropowerinmalaysia.files.wordpress.com/2013/11/the-bakun-hydro-electrical-project-hep-sarawak.pdf, accessed September 30, 2014. Swain, Ashok; and Ang, Ming Chee. 2004. Political Structure and “Dam” Conflicts: Comparing Cases in Southeast Asia. Proceedings of the Workshop on Water and Politics Understanding the Role of Politics in Water Management, Marseille, February 26–27, 2004, pp. 95–113. http://www.saintlazarefoundation.org/Docs/UN/WorldWaterCouncil-WaterAndPolitics.pdf, accessed November 29, 2012. Syawe, Seh Ling Iris. 1990. Industrial and Entrepreneurs’ Profiles of Sarawak. Paper presented at the seminar on “Small and Medium Industries in Sarawak,” jointly organized by the Ministry of Industrial Development, Sarawak, and Mara Institute of Technology, Sarawak Branch, Kuching, June 9–10. Tawie, Joseph. 2010. Bakun Compensation: Dispute Delaying Payments. http://scanenews.blogspot.com/2010/08/bakun-compensation-dispute-delaying.html, accessed December 1, 2012. The Borneo Project. n.d. NGO Coalition Condemns Malaysian Dam Plans. http://borneoproject.org/updates/ngo-coalition-condemns-malaysian-dam-plans, accessed November 1, 2012. ―. n.d. Stop the Dams. http://borneoproject.org/our-work/ongoing-campaigns/stop-the-dams, accessed November 1, 2012. Tollison, Robert D. 1982. Rent Seeking: A Survey. Kyklos 35: 575–602. Tullock, Gordon. 1967. The Welfare Costs of Tariffs, Monopolies and Theft. Western Economic Journal 5: 224–232. UN ESCAP. 1998. Local Government in Asia and the Pacific: A Comparative Study, Country Paper: Malaysia. United Nations Economic and Social Commission for Asia and the Pacific, Publication and Resources. http://www.un.org/, accessed December 1, 2012. United Nations Development Programme (UNDP) Malaysia. 2007. Malaysia: Measuring and Monitoring Poverty and Inequality. Kuala Lumpur: UNDP Malaysia. United States Environmental Protection Agency (US EPA). 2012. Climate Change: Greenhouse Gas Emissions. http://epa.gov/climatechange/ghgemissions/gases/ch4.html, accessed December 1, 2012. Unit Perancang Ekonomi [Economic Planning Unit (EPU)]. 2011. Statistik sosio-ekonomi: Pendapatan & kemiskinan isi rumah [Socio-economic statistics: Household income & poverty]. Putrajaya: Economic Planning Unit, Prime Minister’s Department. Wain, Barry. 2009. Malaysian Maverick: Mahathir Mohamad in Turbulent Times. Basingstoke: Palgrave Macmillan. Wee, Chong Hui. 1995. Sabah and Sarawak in the Malaysian Economy. Kuala Lumpur: S. Abdul Majeed & Co.
World Bank. 1991. Malaysia Forestry Subsector Study, Report No. 9775-MA, Draft. Washington, DC: World Bank. World Rainforest Movement (WRM) and Sahabat Alam Malaysia (SAM). 1989. The Battle for Sarawak’s Rainforests. Penang: World Rainforest Movement and Sahabat Alam Malaysia. Yale Environment Review. 2013. Ecological and Social Price of Mega-dam Power Projects Might Be Too High. http://environment.yale.edu/yer/article/price-of-megadam-power-projects-might-be-too-high, accessed September 2, 2014. Yi, Ge Qiu. 2009. Agi idup, agi ngelaban? [Will the river burst the dam?]. http://aliran.com/963.html, accessed November 29, 2012. Malaysia Ponders What to Do with a White Elephant. Asia Sentinel. April 24, 2012. MTUC Calls for RCI on Influx of Foreign Workers. The Borneo Post. November 26, 2014. MTUC Sarawak Wants More to Be Done to Help Local Workers. The Borneo Post. May 4, 2014. Rights of Owners of NCR Land on Islands in Bakun Recognised. The Borneo Post. July 8, 2013. Sarawak Energy Apologises to Sarawakians. The Borneo Post. June 28, 2013. Dams Can Reverse Rural-Urban Drift. The Borneo Post. June 18, 2013. Cost-Benefit Analysis Done before Building Dams: Awg Tengah. The Borneo Post. May 28, 2013. Batang Ai: 30 Years On. The Borneo Post. May 19, 2013. http://www.theborneopost.com/2013/05/19/batang-ai-30-years-on/#ixzz3W2p465Cl, accessed September 8, 2014. ASNB Remains Sarawakians’ Preferred Choice for Investment: Taib. The Borneo Post. February 20, 2013. Press Metal Denies Polluting Balingian River. The Borneo Post. July 16, 2012. The Sungai Asap Experience. The Borneo Post. June 29, 2012. Unresolved after 14 Years. The Borneo Post. June 17, 2012. Press Metal Sarawak Proves Critics Wrong. The Borneo Post. May 8, 2012. Blueprint for Lake Tourism within a Year. The Borneo Post. March 1, 2012. Villagers Complain of Non-payment of Compensation. The Borneo Post. November 9, 2010. Proposed Score Railway to Be Ready by 2015. Edge Daily. October 15, 2008. Was Cost-Benefit Analysis Done on Dams? Free Malaysia Today. May 23, 2013. RM6b Smelter Project in S’wak Scrapped. Free Malaysia Today. March 27, 2012. ‘Monument of Corruption’ Still Gets Flak. Free Malaysia Today. October 27, 2011. Bakun Pushes Profitable Companies into the Red. The Malay Mail. December 1, 2004. A-G Report: Mismanagement Cost Bakun Dam Operator Extra RM1.3b. Malay Mail Online. October 2, 2013. Stay in Bakun but Change Your Lifestyle, Natives Told. Malaysiakini. July 11, 2013. In Another Blow, Bakun to Be Gazetted as National Park. Malaysiakini. July 6, 2013. No Way Home for Bakun Natives. Malaysiakini. September 28, 2010. Sorrowful Tale of Bakun Evictees. Malaysiakini. September 17, 2010.
Who Really ‘Scores’ in Sarawak’s Industrialisation Plans? Malaysian Insider. July 17, 2014. SEB: Severe Energy Drop in Bakun Caused Power Failure. New Straits Times. June 28, 2013. Grave Doubts about SCORE: Dr Mahathir Just Spoke Out Loud What Others Think. Sarawak Report. January 30, 2015. Mapping Taib’s Corruption. Sarawak Report. January 28, 2015. DAP Slams Sarawak Energy’s CEO for Favouring Taib Companies. Sarawak Report. August 25, 2013. Clean Energy? Sarawak’s Dirty Dam Projects Set up a Stink! Sarawak Report. November 25, 2012. GENOCIDE! Murum’s Secret “Resettlement Action Plan Revealed—EXCLUSIVE EXPOSE. Sarawak Report. September 28, 2012. How Corruption Filters Down: Dirty Deals at Sarawak Energy. Sarawak Report. April 10, 2012. Bangladesh to Send 12,000 Workers to S’wak. The Star. October 21, 2014. Sarawak Energy Awards RM619mil Job to Sinohydro JV. The Star. February 27, 2014. A Potty Problem or Press Metal. The Star. July 3, 2013. Sarawak on ASNB’s Top Three Spots. The Star. February 20, 2013. Protests Won’t Stop Building of 12 Dams. The Star. April 12, 2009. http://thestar.com.my/news/story.asp?file=/2009/4/12/nation/3680959&sec=nation, accessed September 10, 2014. Hydropower Important for S’wak: Taib. The Star. April 11, 2009. http://thestar.com.my/news/story.asp?file=/2009/4/11/nation/20090411165504&sec=nation, accessed September 10, 2014. Sarawak to Build 12 Dams to Meet Future Power Needs. The Star. July 23, 2008. Source: Bruno Manser Fonds (2013b). Note: The Baram dam was cancelled in early 2016. The Murum dam was completed in 2013 and its turbines commissioned by 2015. Construction of the Baleh dam is now proceeding as of August 2016. 1) Sarawak Energy Berhad is the sole supplier of electric power in the state of Sarawak. It is a wholly owned company of the Sarawak state government, which holds sole monopoly interests in power generation, transmission, electricity distribution, and marketing within the state. Its directors are both civil servants and former civil servants along with politicians and businessmen with close links to the former chief minister and current governor Abdul Taib Mahmud. Its key subsidiary is the Syarikat SESCO Berhad, formerly the government-owned Sarawak Electricity Supply Corporation, which was privatized in 2005 (Sarawak Energy 2013). Its senior staff and directors have been accused of being involved in major corrupt business deals involving million-ringgit contracts handed to companies owned either by themselves or by interests close to Abdul Taib Mahmud (Sarawak Report, April 10, 2012; August 25, 2013; BMF 2013c). 2) The lecture slides were hastily removed from the official SEB Web site after environmental groups discovered and downloaded it. In other words, the plan was likely to have remained secret but was inadvertently uploaded. Nonetheless, it remains accessible here: http://assets.survivalinternational.org/static/files/mediabox/Sarawak_Energy_Confidential.pdf. 3) Details about SCORE are available on the Web site of the Regional Corridor Development Authority (RECODA) Sarawak: http://www.recoda.com.my/invest-in-score/what-is-score/. 4) In 1970, the federal government of Malaysia launched the NEP. This was followed by the National Development Policy (NDP) from 1991 to 2000 and the National Vision Policy (NVP) from 2001 to 2010. The NEP specifically addressed issues of poverty and ethnic income inequality and had three key aims: to eradicate poverty, to restructure society to eliminate the identification of race with economic function, and to create a dynamic Bumiputera Commercial and Industrial Community. 5) Among some key early works are those on patron-clientelism (Lande 1964; Scott 1972), relative and embedded autonomy (Evans 1995), and rent-seeking (Tullock 1967; Krueger 1974; Bhagwati 1982; Tollison 1982). For more recent work on Malaysia, see Gomez and Jomo (1997). 6) Research on the Sarawak economy is relatively sparse. However, there are some works by Jackson (1968), Leigh (1979), Bugo (1984), Reece (1988), Abdul Majid Mat Salleh et al. (1990), ITTO (1990), Syawe (1990), Wee (1995), Ooi (1997), Kaur (1998a; 1998b), Majid-Cooke (1999), and Phoa (2003). 7) In 1967 Sarawak’s GDP was RM768 million at constant 1978 prices. By 2010, this figure had reached an estimated RM50,804 million. 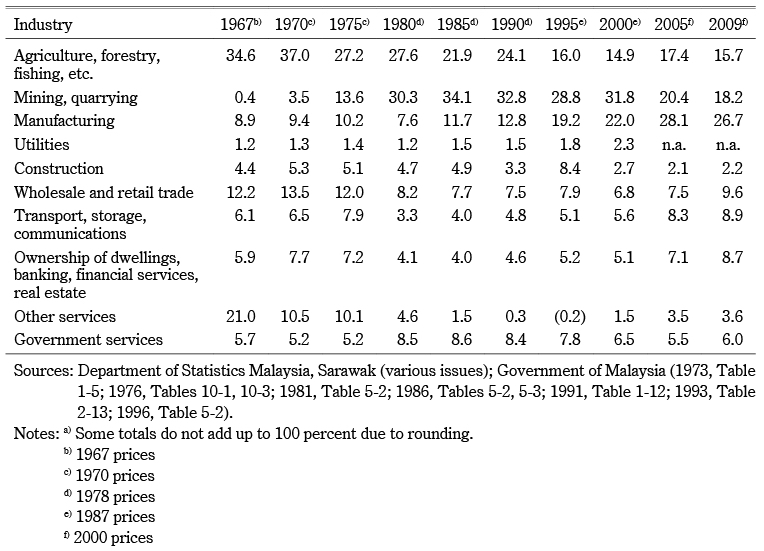 GDP per capita (constant 1978 prices) in 1967 was RM915. By 2010, it was an estimated RM20,560 (Department of Statistics, Sarawak, various issues). During the period of the Ninth Malaysia Plan (2006–10), mean monthly gross household income also rose from RM2,725 (2004) to RM3,581 (2009) (Government of Malaysia 2010, 399). 8) Poverty is complicated, especially if one takes into consideration the ratio of regional poverty vis-à-vis the national incidence, i.e., the poverty gap and rural-urban poverty figures. And yet, despite large gains, these aggregated figures still put Sarawak among the five states with the highest poverty and hard-core poverty rates in Malaysia. In 2009 the poverty rates of the other four states were: Sabah (19.2 percent), Perlis (6 percent), Kedah (5.3 percent), and Kelantan (4.8 percent). Hard-core poverty figures were: Sabah (4.7 percent), Perlis (0.8 percent), Kedah (0.8 percent), and Kelantan (1 percent) (Unit Perancang Ekonomi 2011). UNDP estimated Sarawak’s poverty rate in 2004 for a household of 4.6 persons to be 8.02 percent and individuals at 10.63 percent based on a poverty line income (PLI) measurement (Urban PLI: RM799/month; Rural PLI: RM778/month) (UNDP 2007, 63–64, 68). 9) The Amanah Saham Nasional (ASN) and the Amanah Saham Bumiputera (ASB) investment trust schemes are government initiatives to encourage Bumiputeras to invest in their medium- and long-term future. Through these initiatives, the government hopes to lift Bumiputeras out of poverty and help them achieve a higher standard of living. Launched in April 1981, the ASN scheme is a variable-price investment product that seeks to “generate reasonable level of income distribution and capital appreciation to the unit holders through a diversified portfolio of investments” (ASNB 2015). On the other hand, the ASB, which was launched in January 1990, is a fixed-price investment product that seeks to “generate long-term, consistent and competitive returns to the unit holders whilst ensuring the preservation of capital at minimal risk tolerance level” (ibid.). These investment schemes, along with numerous other similar schemes, are thus designed to help the government of Malaysia achieve the dual aims of the New Economic Policy (NEP): eradicating poverty and restructuring society. 10) The term “Bumiputera” refers to indigenous persons or people of Malay (Melayu) and native communities of Malaysia. For more information on the definition of Bumiputera, see Ooi (2004, 287). 11) To gauge progress in eradicating poverty, the government has utilized a poverty line income measurement that assumes the basic income level necessary to sustain a household within a minimum standard of living. First published in the Mid-term Review of the Fifth Malaysia Plan, the poverty line income is based on a basket of goods comprising food as well as clothing, footwear, and other non-food items such as rent, fuel, power, transport and communications, health, education, and recreation for a household of about five persons. In 1987 the poverty line income was defined as RM350 for a household of 5.14 persons in Peninsular Malaysia, RM533 for a household of 5.36 persons in Sabah, and RM429 for a household of 5.24 persons in Sarawak (Government of Malaysia 1989, 45). In the 10th Malaysia Plan (2011–15) this poverty line income was revised to RM763 (Peninsular Malaysia), RM1,048 (Sabah and Labuan), and RM912 (Sarawak) (Government of Malaysia 2010, 397). 12) More current figures are not available. 13) For more information about the transformation of Sarawak’s forestry into cash crop plantations, see World Bank (1991), Kaur (1998b), Majid-Cooke (1999), Phoa (2003), Jomo et al. (2004), and SarVision (2011). See also official agricultural land use data available on the Sarawak State Planning Unit Web site: www.spu.sarawak.gov.my. 14) The investigative Web sites of Sarawak Report (www.sarawakreport.org), Bruno Manser Fonds (www.bmf.ch/en/), and Global Witness (www.globalwitness.org) are the best Web sites that document these practices in Sarawak. 15) Critical scholars do not necessarily accept that the statistical figures of the Sarawak government relating to forest cover and oil palm plantations are reliable. Sarawak forest policy sees forests classified into three main categories: permanent forest estates (PFE), totally protected areas, and stateland. Managed by the Sarawak Forest Department (licensing and regulatory functions) and the Sarawak Forestry Corporation (operational functions), all the above lands are liable to be subjected to either licensed economic activities or illegal logging. Most logging and plantation activities occur on PFE and state land. Nonetheless, despite all these lands being transformed by massive timber extraction and cash crop plantations, they remain officially classified as forests and are declared as such in official statistics. This gives the impression to all who are unaware that Sarawak remains a state with a high forest cover. For further information, see Liew (2007). 16) The study showed clearly, and on the basis of scientific data, that “[O]verall, only 8% and 3% of land area in Sabah and Sarawak, respectively, was covered by intact forests under designated protected areas” (Bryan et al. 2013). In other words, this study concluded that “very few forest ecosystems remain intact in Sabah or Sarawak” (ibid.). 17) These “special concessions” to Sarawak in 1963, relative to the other states in Peninsular Malaysia, were designed to win over the native groups of Sarawak who were initially hostile to the idea of the formation of Malaysia (Lim 1997). 18) A map showing the geographic spread of SCORE is available at http://www.recoda.com.my/invest-in-score/score-areas/. 19) These industries are: aluminum, glass, steel, oil-based, palm oil, fishing and aquaculture, livestock, timber, marine, and tourism (RECODA 2015d). 20) The deputy chairpersons of RECODA are the deputy chief minister and the second minister of planning and resource management. The state secretary is the RECODA board secretary, while the state financial director and the State Planning Unit director are also board members of RECODA (RECODA 2015b). 21) These are functions that are focused primarily on the provision of public services, e.g., environmental, public, social, and developmental services (UN ESCAP 1998). 22) Sarawak also has an abundance of coal (estimated at 1.46 billion tonnes) and natural gas (40.9 trillion cubic feet) (RECODA 2012). 23) The Employees Provident Fund is the sole social security and pension fund set up by the federal government, under the auspices of the Ministry of Finance, to manage the mandatory retirement contributions of the private sector in Malaysia. 24) For information on Sarawak Energy Berhad (SEB), see footnote 1. 25) Although China Institute of Water Resources and Hydropower Research (CIWRHR) dispatched some technical staff to Sarawak to undertake site visits and surveys in 2008, it is unclear whether the project extension was ever undertaken or completed as no further information is available. 26) The continued high levels of biochemical oxygen demand detected in Batang Ai suggest that decomposition of biomass continues with bacteria consuming the submerged organic matter. Hydrogen sulfide and methane are by-products of this process. As noted by the US EPA, methane is emitted from a number of natural sources, with wetlands being the largest source since they emit methane as a consequence of decomposing organic materials in the absence of oxygen (US EPA 2012). 27) For example, Ekran and Global Upline were owned by Ting Pek Khiing, who is known to be a close associate of Dr. Mahathir Mohamad; MTD Capital, Ahmad Zaki Resources, Syarikat Ismail, and Edward & Sons were all politically linked companies (How et al. 2013). 28) “Major construction contracts for the Bakun Dam project were given to Asea Brown Boveri (ABB), Companhia Brasileira de Projetos e Obras (CBPO), and DongAh of South Korea. However, after the 1997 economic crisis hit Malaysia, these private companies received USD250 million as compensation when the Malaysian Ministry of Finance decided to take over the project from BHC. The revived Bakun HEP was taken over by Sarawak Hidro Sdn Bhd (SHSB) and its main contractor was Malaysia-China Joint Venture (MCH JV) for the civil works portion” (Swain and Ang 2004, 103). 29) CMS is owned and controlled by the family of Sarawak Governor Abdul Taib Mahmud. In the 1990s he was chief minister and led the Sarawak BN government (Aeria 2002). 30) “Due to lack of employment and limited resources in the resettlement, seeking paid employment elsewhere seems to be the most common trend amongst the settlers. After leaving school, married men and women seek employment of any sort to send money back to their family at the resettlement. The settlers also invest in education for their children hoping that one day when the children have jobs, they will send money home” (Jehom 2008, 152). Welyne Jehom (2008) studied one community, the Kenyah-Badeng of Long Geng, who were involuntarily resettled in Sungei Asap by the Bakun Dam project. Her findings of the Kenyah-Badeng are replicated throughout the other longhouse communities of Sungei Asap. See also Soda (2001) for a discussion on this phenomenon of declining agricultural activities with rural-urban out-migration of labor in the Iban village community of Rantau-Kemiding, Kanowit, Sarawak. 31) This was mainly in the form of tarred roads, schools, and health clinics (SMLD and SALCO 2008). 33) See also the report by the Coalition of Concerned NGOs on Bakun (Gabungan), Malaysia (1999) titled “The Resettlement of Indigenous People Affected by the Bakun Hydro-Electric Project, Sarawak, Malaysia” as well as the Borneo Project, “Broken Promises at Sungai Asap Resettlement,” http://borneoproject.org/updates/broken-promises-at-sungai-asap. 34) “If you give the land to these people just because they have been roaming in the area, then are we going to send everybody else to the sea?” (Wan Junaidi Tuanku Jaafar, MP for Santubong) (Malaysiakini, July 11, 2013). 35) As far as is known, there have not been any environmental impact studies evaluating the dam’s environmental footprint. If any have been carried out, their reports have not been made available. 36) In February 2014, Sarawak Energy awarded a major contract worth RM619 million for the construction of the “500 kV transmission backbone project” to a joint venture comprising Sinohydro Corp (M) Sdn Bhd and Trenergy Infrastructure Sdn Bhd (The Star, February 27, 2014). Both these companies have worked on other major infrastructure projects since 2008, namely, the Bakun-Similajau and Murum Junction Transmission Line Projects (Sarawak Energy 2014). Sinohydro Corporation is also a key partner of the Malaysia-China Hydro Joint Venture Consortium. 37) Other key international protocols are those of the World Bank Operational Policies, the International Finance Corporation Performance Standards, and the Millenium Development Goals—all of which provide clear standards and guidelines for the resettlement of indigenous communities and poverty erradication (Sarawak Report, September 28, 2012). 38) The Australian consultancy company Hydro Tasmania seconded several key staff to Sarawak Energy, including the Murum dam project director and the senior project manager for the proposed Baram and Baleh dams (BMF 2012b). 39) Such crony business contract awards are not unusual in Sarawak and have been ongoing for decades. For further information on these business practices and the links between politicians and businesses in Sarawak, see Aeria (2002), Mersat (2005), and the Web sites noted in footnote 14. 40) A ministerial reply in the state assembly insists that a cost-benefit analysis was carried out but that “under normal circumstances, it was not a business practice to make the cost-benefit analysis public” (The Borneo Post, May 28, 2013). 41) An informative Australian documentary by SBS Dateline titled The Last Frontier focuses on the construction of the Bakun dam before moving on to discuss the corporate links between business and politicians in Sarawak and Tasmania in the planning and construction of the proposed Baram dam. It lucidly exposes how a nexus of politics and business in search of profits disempowers local indigenous people of Sarawak in the name of development that transforms the natural environment of Sarawak in a massive way. See The Last Frontier here: https://www.youtube.com/watch?v=87Ed2da5hLs. 42) Press Metal Sarawak (PMS) is a subsidiary of Press Metal Berhad (PMB), which owns 80 percent of PMS shares. PMB is a Malaysia-based aluminum company with an extensive global presence. Set up in 1986 as a privately owned local aluminum extrusion company, it has grown into a globally integrated enterprise comprising both upstream smelting capacity and downstream extrusion, distribution, and trading of aluminum products. PMB is majority owned and controlled by the Koon family (PMB 2013). The remaining 20 percent of PMS shares are held by Sumitomo Corporation (PMB 2010). 43) Some villagers with the assistance of a local NGO, Peoplesdocumentary (2012), posted a YouTube video titled Pollution from Aluminium Smelting Plant at Balingian, Mukah with these allegations, available here: http://www.youtube.com/watch?v=8wJJx2ng-Yo. 44) “Sarawak lawmaker Chiew Chiu Sing said ‘in reality, Samalaju was a boon for big industries and Malaysian companies with high connections. Support industries such as those building and operating the workers camp in Samalaju and those constructing the roads there have all been cornered by companies close to Sarawak politicians’” (Malaysian Insider, July 17, 2014). 45) In late 2014, the Malaysian government backed by the Sarawak state government signed a Memorandum of Understanding to pave the way for the import of 12,000 Bangladeshi workers for the oil palm plantation sector on top of the 5,000 Bangladeshis already working in the state (The Star, October 21, 2014). The state government justified this move citing a severe shortage of labor (30,000 jobs) in the oil palm plantation sector even as “tens of thousands of Sarawakians” continued to leave the state and their families in search of better wages and employment conditions in Singapore, Johor, Kuala Lumpur, and Penang (The Borneo Post, May 4, 2014). 46) There are no accurate figures on the number of foreign workers (legal and otherwise) in Malaysia. Estimates put the figure at anything between three million (The Borneo Post, May 4, 2014) and six million (The Borneo Post, November 26, 2014).